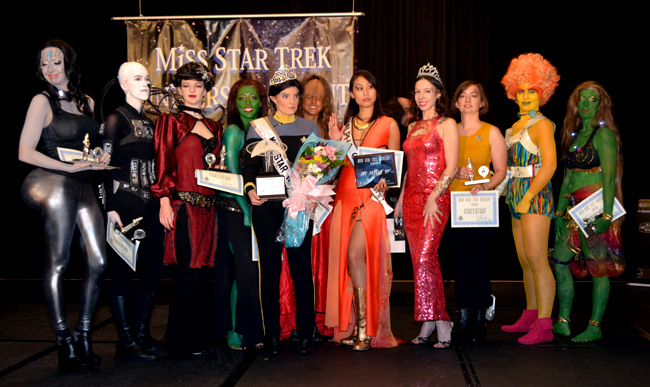 There's only one pageant like it in the world...in all of the Cosmos for that matter—and it's the Miss Star Trek Universe Pageant. 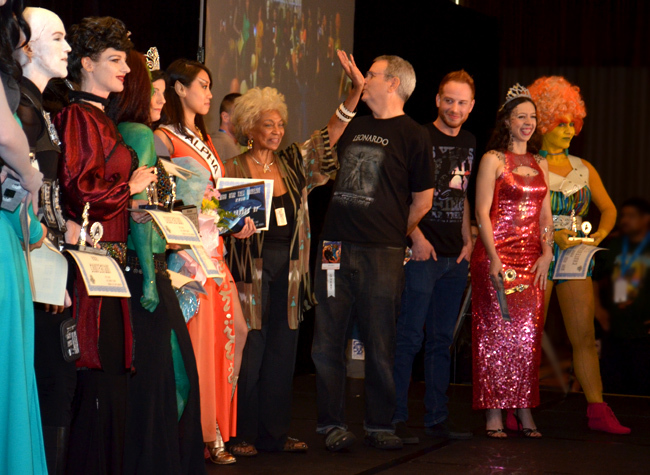 This year's Pageant, held Labor Day Weekend at Dragon*Con in Downtown Atlanta (the center of the pageant Universe! ), was won by a Vulcan...a very funny Vulcan. 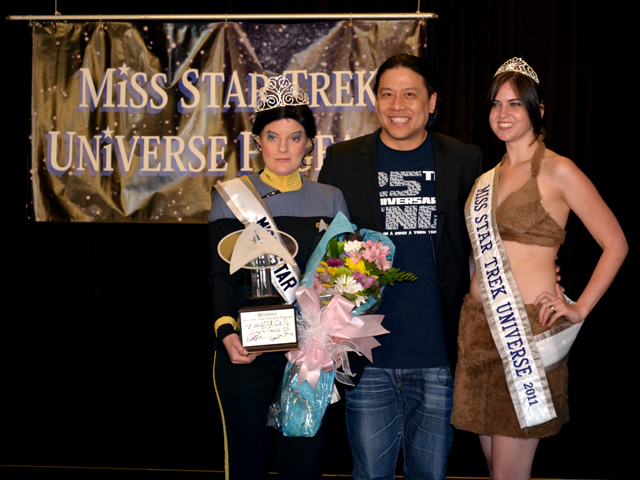 This year's crowned winner is pictured here with Garret Wang, Trek Track Director and Ensign Harry Kim on Star Trek: Voyager, and Miss Star Trek Universe 2011. Among the dozen contestants was "Kim Cardassian"—far left—and a delegation of beauties from other planets...from the Alpha Quadrant and one from the Delta Quadrant, as well as a couple of representatives from Earth. The judges panel was indeed distinguished. Nichelle Nichols, Lt. Uhura from Star Trek: The Original Series; David Gerrold, author of "The Trouble With Tribbles" (the most popular episode ever of the original Star Trek series); and a representative from Garrett Wangs t-shirt company, Cosmic City Tees, were wooed by the contestants during fashion, talent, and question segments of the pageant. The talent portion ranged from performances of opera to a stand-up comedy routine. The Orions danced, of course. And some musical instruments made their way to the stage. 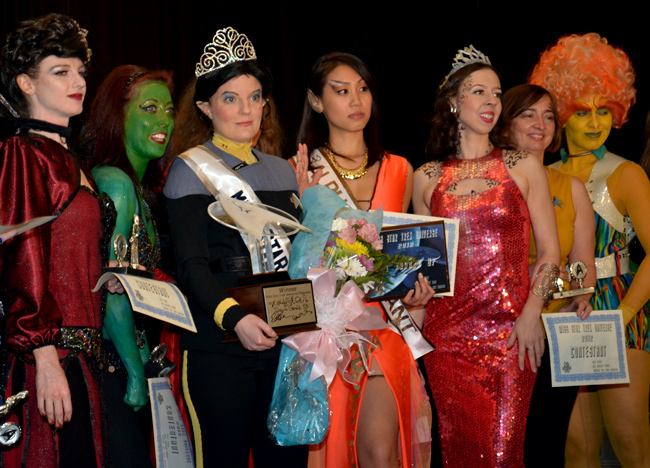 Without a doubt, the contestants were a very talented group! This was the third annual Miss Star Trek Universe Pageant and based on the thousands of conventioneers who attended, this particular pageant will :live long and prosper." 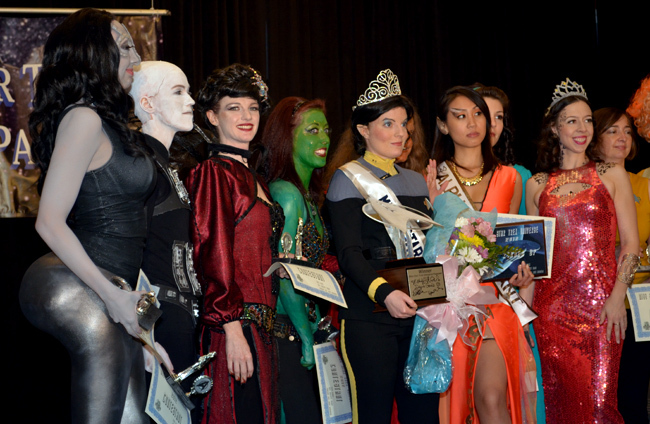 I heard about the pageant on the Hawker site. I think that is a good idea. T. W.
I meant Gawker. Sorry for the confusion. T. W.